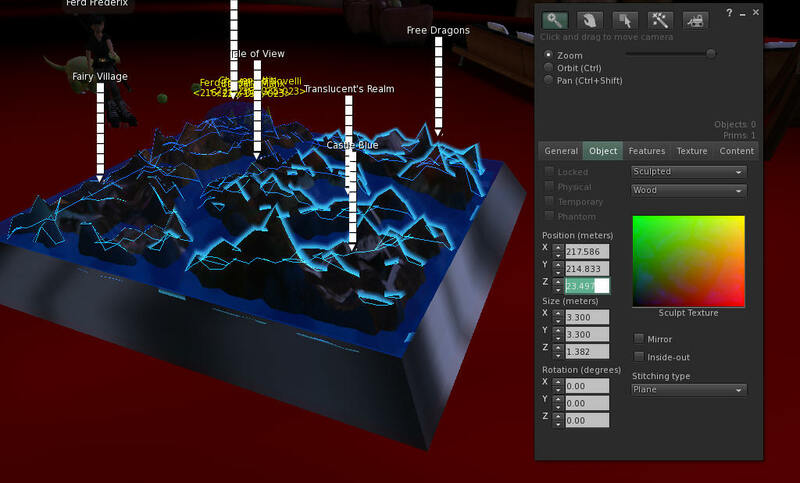 In this article, I'll show you how to use free tools to create your very own Sim Scanner, with realistic topography and moving people indicators. We'll be combining a free sim scanner with your sims topography with moving, stirrable flash water. 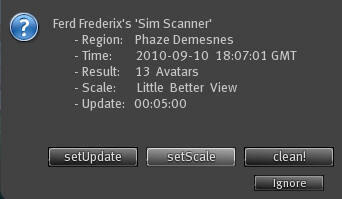 You can come to my sim, Phaze Demesnes, and take a copy of the free sim scanner. It is full mod, copy, and transfer. Change the sim texture to your own sim, and off you go. 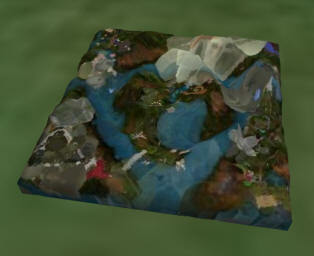 Instructions are located in the section to Get Your Own Sim Map. You'll need to make two prims. Put my flash water script inside it, and color it light blue with a transparency of about 25-33%. I colored the sides blue at first, with no transparency, and I made the top partly transparent as shown in these two images. Then I decided steell would look better against the blue. The textures for regular viewers are a water textures, and steel band around the edges, with a little blue color. 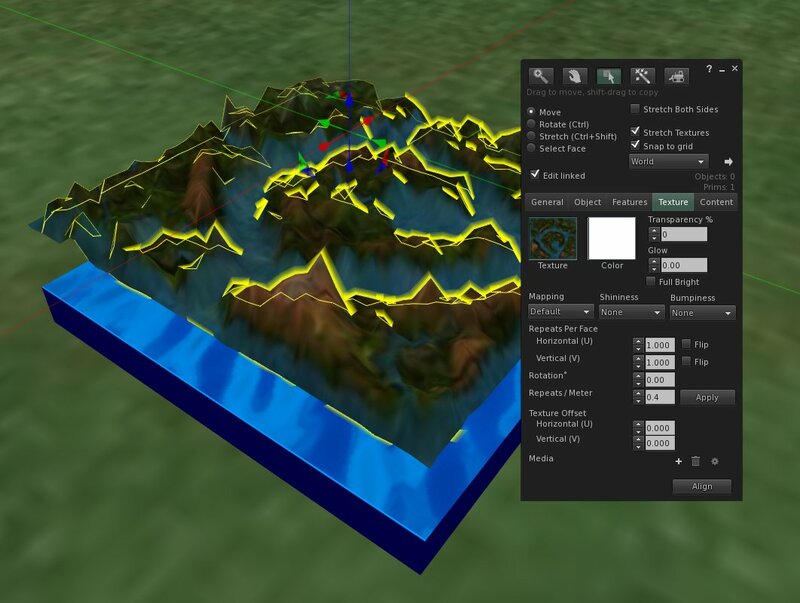 You will need to offset the texture by 0.6 vertically to eliminate the blank band from the water script. 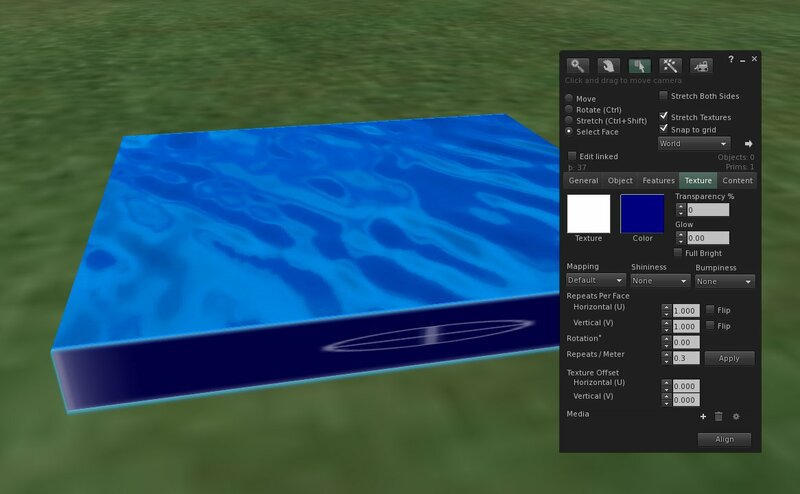 I made my water prim with tapered edges of about 0.12, and it was 3.9 X 3.9 X .38 meters tall. The next part is courtesy of Zeja Pyle. Go to Bashora.com (link opens in a new window) and teleport to the store in Nonacho. Grab a copy of the free Geoscanner from the 1st floor (you tp to the top floor). Go on your region, and rez it in an area where the script is allowed. You can also wear it, or attach to your screen as a HUD, but try to not move during the scan. Click the Geoscanner box to start. It will announce in chat "GEO-SCAN STARTED!". This will take about 1 minute. 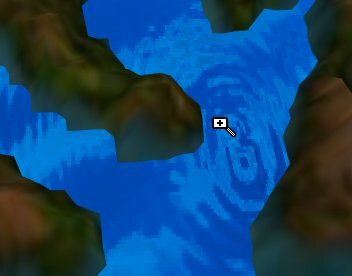 When done, the prim will announce: "GEO-SCAN COMPLETED!" Once you have scanned your sim, navigate back to Bashora.com and locate your sim in the database. 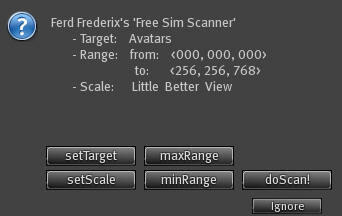 Note: The LSL and PHP scripts have a small bug: Any sim name with a space in it will be stripped out. Someone forgot to llEscape(). The link that is spoken in world won't work if your sim has spaces in the name. You can still navigate to your sim by removing the space. In my case, the link was http://geosculpties.bashora.com?index.php?name=Phaze Demesnes, and it should be http://geosculpties.bashora.com?index.php?name=PhazeDemesnes because that's the way the server stored it. Zeja uses HTML tables to make the topography image (I wish Zeta coded this in Imagemagic, but that's another story). You will not be able to right click and save the image map! All you will get is a single pixel. Once you have located your sim, you'll need to press the Alt-Print Screen key combination. Use any image editing tool you want, paste the screen grab in the image editor. Zoom in and crop down to the sculpt image of your sim. 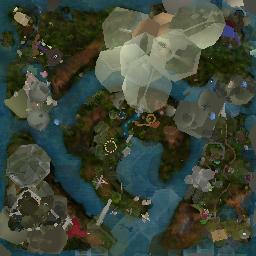 Once you have that image, upload it to Second Life. Once you have a image, save it to your hard disk, and upload it to Second Life. 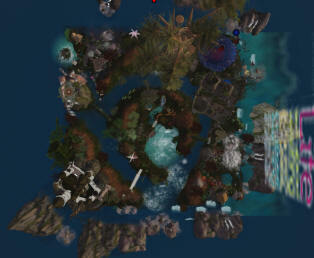 You may not like the way Second Life map servers mash all the values of the images together. 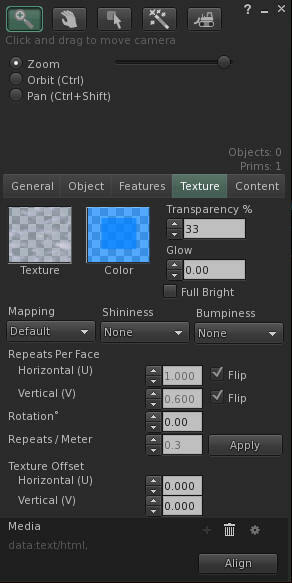 The system does not use the textures to make a map, instead, it used the average value of all the pixels in a texture to make the image. So you can use the color image, or use the image of just the topography from Ferd's database. The best method is to screen grab an image from well above your sim. 3) Fly to about 128,128 at an altitude of about 350 meters above your sim.Click Ctrl-P and set you Graphics draw distance up to at least 512 meters. (This could take a while) Wait until you can see the sim clearly below you. You will need flight assist to get that high, so wear a flight feather or a flight band. 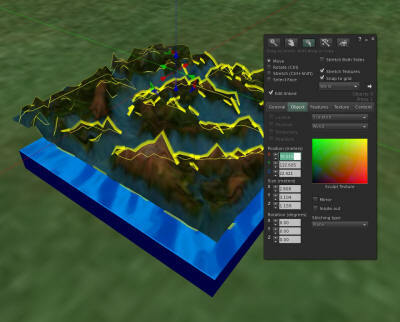 Upload the sculpt and the sim image, and put the sculpt on the Sculpt map image. Add this simple script to a prim, and put in the Description (not the name) the name you want to appear. 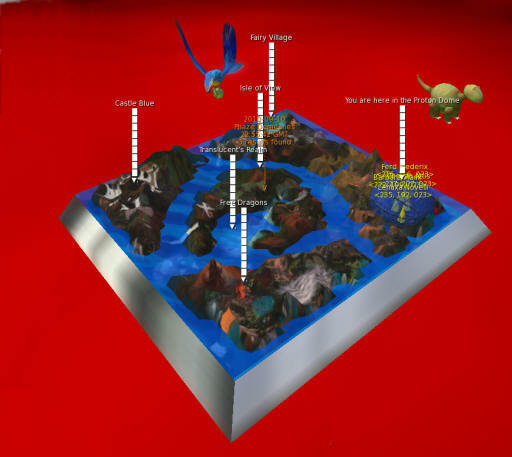 The photo below shows the "Isle of View". 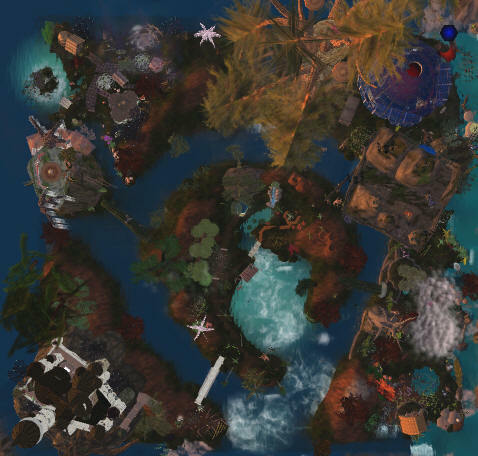 Now, teleport to Phaze Demesne and grab a copy of the free Sim Scanner from the middle of the dome. 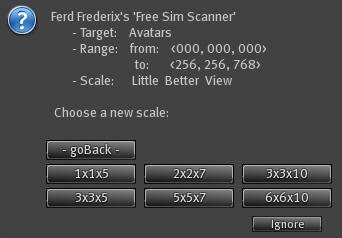 If you want to make your own sim scanner from scripts, look in my free script collection for all the scripts and instructions. 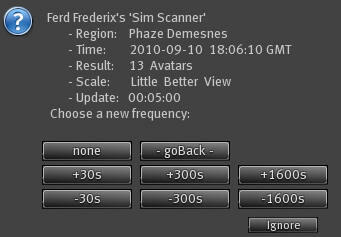 1) Rez the Sim Scanner. A square, thin prim will appear. 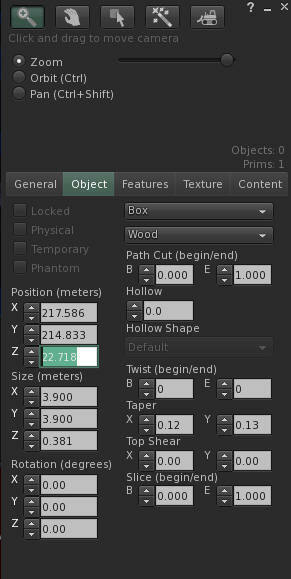 3) Click SetTarget and click the 3X3X5 option to match the dimensions you have used so far. 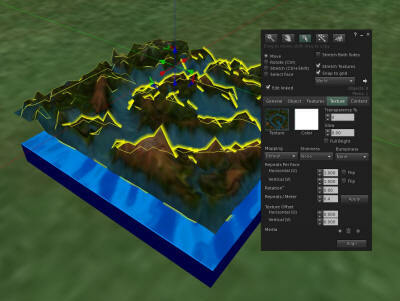 You can make it larger or smaller and resize your map to fit. 4) Click doScan! 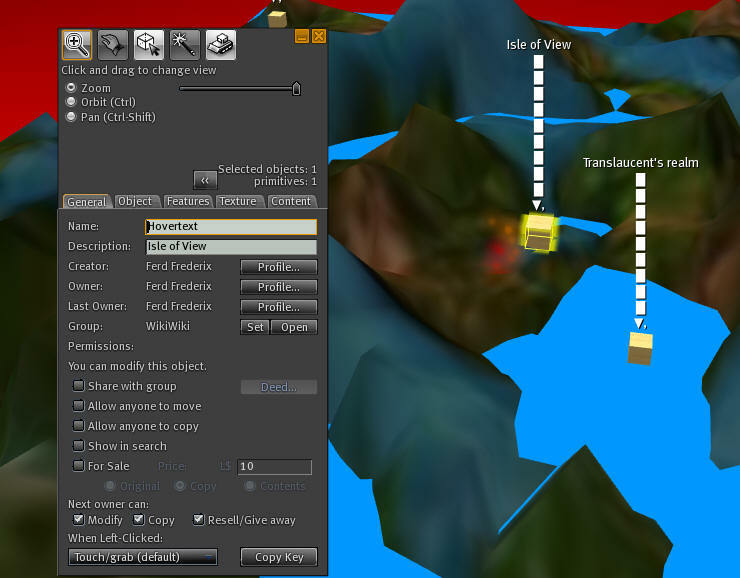 and it will run a scan and rez a small yellow cone for every avatar. Nothing happens:? It looks stuck? You renamed it. If you change the name, you also need to change the name in scanner script. 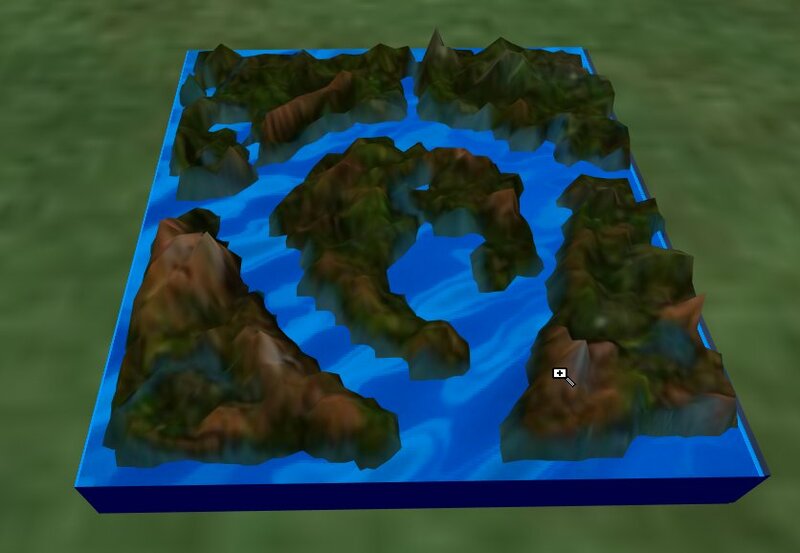 6) Move your 3-D Map on top of the scanner, make it transparent, and link it as the last prim. I put mine just above the water level so that the cones will appear in the correct place.